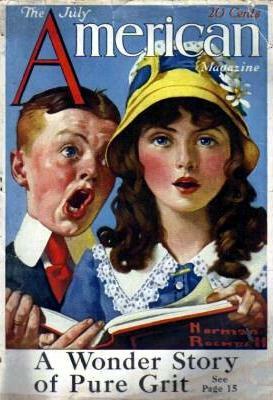 Boy and Girl Singing, this Norman Rockwell painting, appeared on the cover of American published July 1919. This was the fourth picture painted by Rockwell to appear on the American Magazine cover. American Magazine published only seven Rockwell illustrated covers, between 1918 and 1923. Most likey, the smaller magazines wanted Rockwell's signature and art on the cover to provide a boost in newstand sales. The artist was already very popular by the time this cover appeared. In this painting, Rockwell revisits a familiar theme. This painting shows a pair of children singing. We do not know if they are singing in school or church. During the era that this picture depicts, children often wore their good clothes to school. If this were a picture from a modern era, we would assume that they were singing in church or, if at school, that theye were singing in a program, not in a class. The boy is wearing a tie and one of his best collars. He is singing with great gusto. It almost looks like he is trying to impress the girl with his singing ability and volume. The girl looks more calm and collected than the boy looks. She is holding the song book. She looks like she is concentrating on her singing than on her companion. The question that this painting raises is whether the girl can sing on key with the boy singing in her ear. Do You Have A Great Story, Opinion Or Contribution About Boy and Girl Singing?